Dolf De Roos realised at a young age that most of the rich made (and kept) their wealth through real estate. Armed with that knowledge he worked hard and earned money without ever receiving a pay slip or a salary from an employer. What allowed him to do it was real estate! 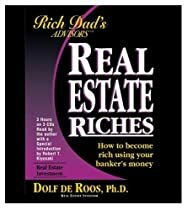 In this book, De Roos shows why investing in property is so astoundingly simple and lucrative. Topics include: negotiations and submitting offers; increasing the value of your property; and dealing with laws, rules and regulations. De Roos opens up and gives an insider’s view of his approach, attitudes, techniques and secrets in the real estate game.